I’m not usually one for borders. 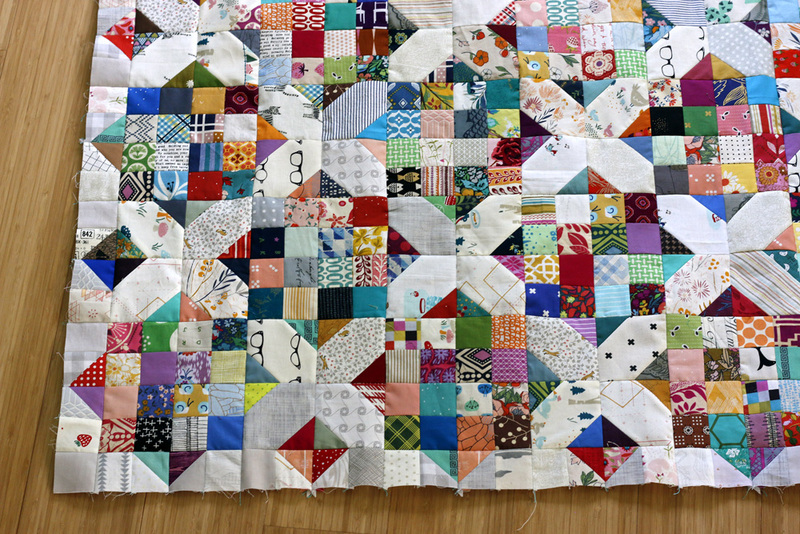 I generally prefer to make more blocks to bring a quilt up to size, especially with a scrap quilt since there are always more scraps! But this time feels different. These cross roads blocks emerged from my crumb-size scraps. I used all of my crumbs that were big enough and lots of triangle scraps too. With all of those scraps incorporated, the cross roads blocks feel complete. I just can’t see cutting up my bigger scraps to keep making itty cross roads blocks. I was going to have a lot of leftover low-volume scraps until I realized I could use them to finish out the edge of my patchwork. I made 1.5” finished half square triangle blocks and combined those with 2” cut low volume squares as shown below. As a result, the edge of the patchwork alternates between finished cross roads blocks and little faceted squares. Love! Just in - Matchmade, a stunning rainbow of fabrics designed by Pat Bravo. This Art Gallery collection brings together a variety of subtle motifs as an assortment of unique, modern blenders. I’m pleased as punch with this happy scrappy patchwork top, but it’s turned out too small! At just 45” square, it could be a baby quilt, but I’m thinking it’s more likely to find a home as a throw. So, border ideas anyone? I was thinking a slanted piano key border made up of bright scrappy strips. Under that plan, I’d add a thin low volume border to give the center some space. Still I worry it could be visually overwhelming. Hmm… maybe a low volume piano key border instead? Or, perhaps solid scrappy strips running parallel to the patchwork edges (instead of piano style) for a simpler frame? I want to avoid using large cuts of a single fabric for the border. I love how scrappy this feels and want to stick to that ethos. I might need multiple borders to make this big enough!